Do you eat apple pie with a slice of cheese on top? A slice of salty cheddar cheese balances a sweet slice of apple pie perfectly. For our desserts day in #AppleWeek, I decided to take it to the next level and add the cheese directly into the crust! Honestly? I was surprised at how subtle the cheese was. I reaaaally had to search for the cheese flavor. It was just the lightest savory note almost lost among the sweetness of the pie. So here’s the bottom line: if you’re looking for something just a little bit different than the usual or if you have super skeptical guests, this crust is for you. If you’re a diehard pie and cheese lover, add it to the top (with or without the cheddar crust). 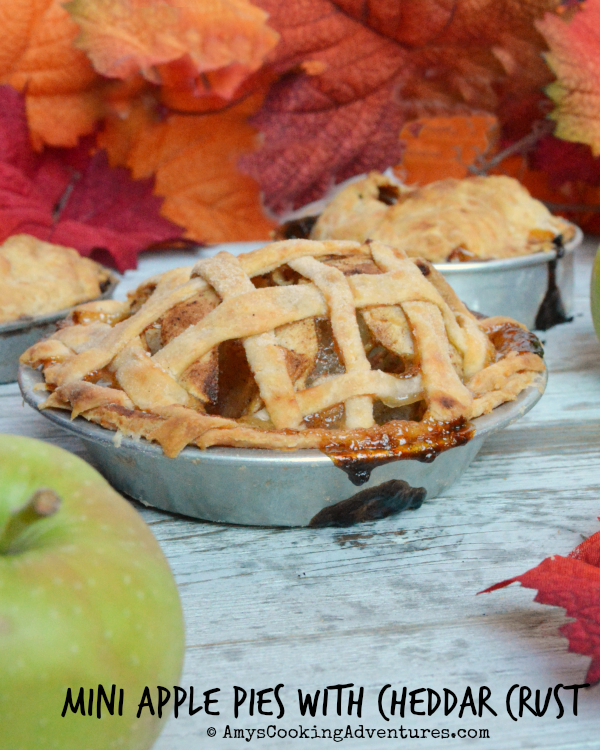 Either way, these tiny little pies are adorable and gorgeous and make me happy! -I recommend shredding the cheese only just before using, using a fine grater. Keep the cheese loosely packed in the measuring cup, so it doesn’t stick together. Using a pastry cutter or two forks, cut the butter pieces into the flour until it forms pea sized crumbles. Slow stir in the cheese, taking care that it doesn’t clump. Beginning with 1 tablespoon of water, sprinkle the water over the flour mixture and lightly mix until it forms a ball. Add additional water as necessary. Split the dough into three equal pieces. Set two aside and cover with a damp kitchen towel. Lightly flour a surface and roll the dough into a round 2 inches larger than the diameter of the pan (my pie tins were 4-inch wide, so my dough was 6-inches). Gently fold the dough in half twice (into quarters) and place in the pie plate. Gently unfold the crust and press onto the sizes of the pan. Remove any dough that hangs over the edges of the pie plate, reserving the dough to cut into a lattice (alternately, leave the dough and fold over after filling for a more rustic pie). Whisk together the cinnamon, sugar, and flour. Toss the apples in the sugar mixture. Divide the cinnamon sugar apples between the three pans. Roll out excess dough to make a lattice or fold over the excess dough to make rustic pies. Place the pies onto a baking sheet. Bake in the preheated oven for 30-40 minutes or until the crusts are browned and the pies are bubbly. 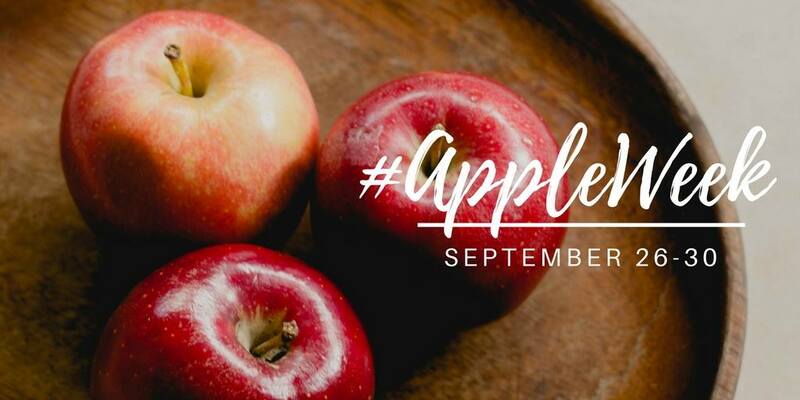 Don't miss these delicious sweet treats from other #AppleWeek bloggers! Great idea adding the cheddar to the crust Amy. 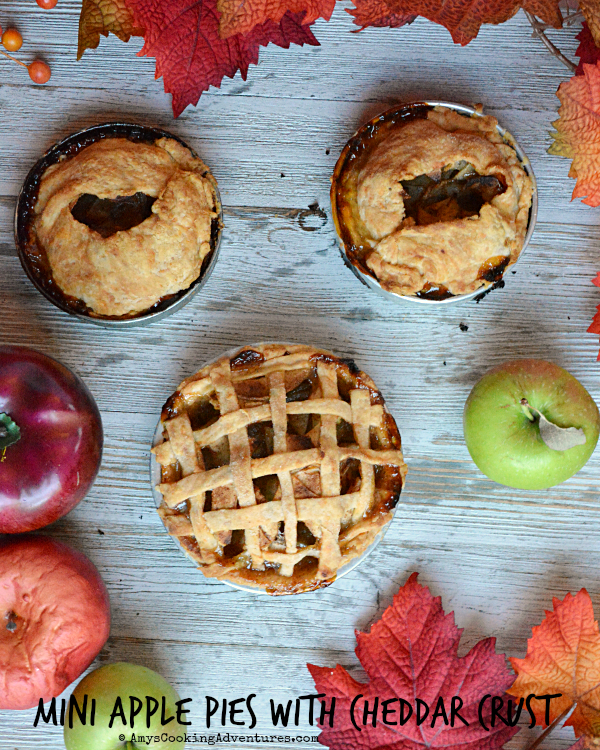 Your pies are adorable. Everything is cuter in mini form! And putting cheese in the crust is a great idea. I can't wait to give that a try! My favorite pie in a mini dessert! Could life be better?! I'm never been a cheese on apple pie person but maybe you subtle touch of cheddar in the crust I'll have to try. I wonder where the tradition of putting a slice of cheese on top of apple pie came from?